We apologize for getting your hopes up about the iPhone's GPS capabilities, because with the release just days away, the first reviews of the device are pouring in and there's some bad news about the GPS functionality. Or lack thereof. David Pogue of The New York Times points out that the iPhone 2.0, while it still has real GPS and not the location-based-shenanigans of its predecessor, is not ready to compete with the big boys of the navigation world. Unfortunately, there's not much you can do with the G.P.S. 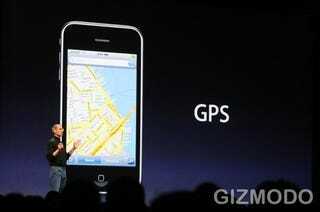 According to Apple, the iPhone's G.P.S. antenna is much too small to emulate the turn-by-turn navigation of a G.P.S. unit for a vehicle, for example. Instead, all it can do at this point is track your position as you drive along, representing you as a blue dot sliding along the roads of the map. Even then, the metal of a car or the buildings of Manhattan are often enough to block the iPhone's view of the sky, leaving it just as confused as you are. The GPS manufacturers have nothing to be scared about and because it's the fault of the hardware, don't expect TomTom or other GPS manufacturers to get involved creating supported iPhone software.